Need a quick recipe for chicken, this is one of my staples for chicken I have been making for years and it really doesn’t need a lot of ingredients, the most important is to have fresh basil. When I go to the Asian market I always stock up on Thai red curry paste, and coconut milk. The green curry paste is great paired with vegetables if you are vegetarian especially delicious with eggplants. I also buy my basil at the Asian markets I find it is fresher and you get more for your buck. Wow, this is my go to on a night I just don’t want to spend a lot of time in the kitchen. Easy, yet delicious! I’m so excited to try! Quick question though, is there any other liquid to this, it seems like it might be too thick? Hi Heather, The consistency is creamy, although if you find it too thick for your liking then you can definitely add a bit of water. Enjoy! I made this tonight with leftover chicken. I was going to order chinese food because i was a little tired and wanted something quick. Then i decided i didn’t want to spend the money so i made this instead. THIS WAS DELICIOUS! I did use some chicken stock to thin out the sauce but this is going to the top of my list of favorites. Thanks, you gave me a wonderful dinner. This looks great! One question, how much is 4 “slices” of ginger? You can slice them thinly, or omit if you don’t like ginger. This was my questions too. should it be cut across the small part of the root or length wise? I am making this for a friend who is staying with us this week. He gave me the recipe and said it was his all time favorite! I am looking forward to making it for him. I made this dish and it was fantastic!! If I substituted this with beef, do you think it would come out the same? Thank you for giving this recipe a try. You can make this with any protein that you like, it will still taste delicious. 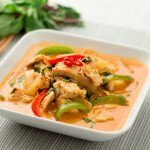 Any brand of red curry paste that you enjoy? Im always trying to recreate thw red curry we get from our local restaurant but we always fall flat. Just made this for my family and they love it! 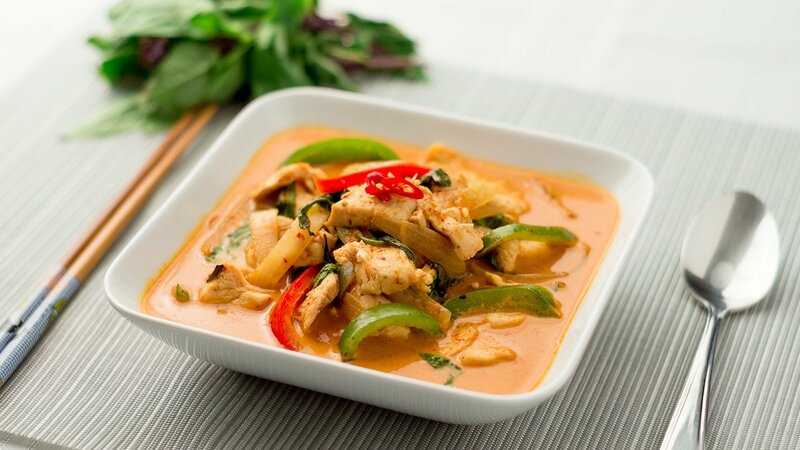 I was craving some pineapple red curry that we tried at a Thai restaurant nearby… This is EXACTLY what I remember! I had 3 chicken breasts and 24 oz of coconut milk (I was not sure how much ‘1/2 can’ is). I also added pineapple and used ginger powder. The sauce is a perfect consistency without any extra water. Thanks, this is a great one! I want to ask if I can use this image for my website. I’m wait excited for your awnser. First time i made the dish came out great !! The second time though i had a problem with the green peppers, the dish was a bit bitter.. what did i do wrong the second time? And may i ask does coconut milk is all the same ? Cause i took one with was a bit steady , the other was too sweet and one too watery. Do you have any brand that you recommend ? Wow!!! It looks great. Thank you for the recipe.. I will try it. 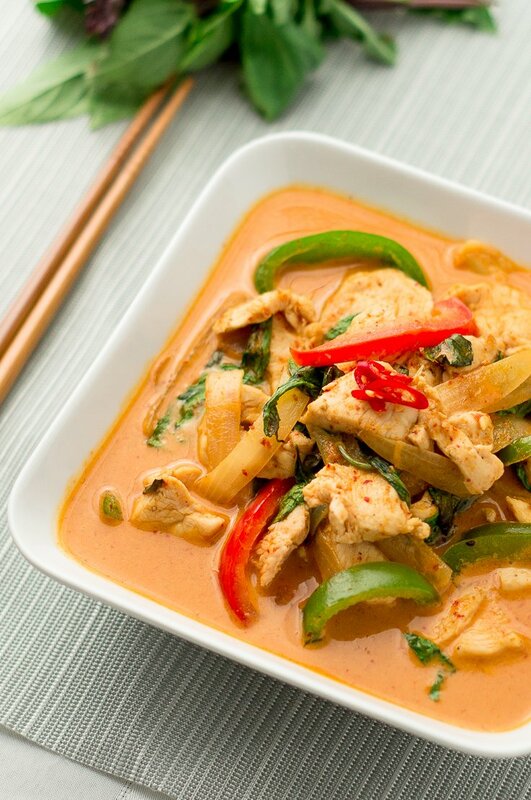 Is this curry similar to a panang curry? I’m excited to try it with shrimp. Yes it is similar, I cat wait for you to try its a very delicious and quick supper! Even with the changes – it was amazing!!!! Do you recommend using Thai basil only or would Italian basil work with this? I can get to an Asian market, but I grow basil year round. Can’t wait to try this recipe! You can use the basil you have at home, but the next time you can get your hands on Thai holy basil I would suggest trying it out, it really gives a fragrant taste to the dish which is iconic in Thai food. This is the best and it’s very easy to make!!! Thank you thank you. Thank you for stopping by and leaving your feedback, I really appreciate it.